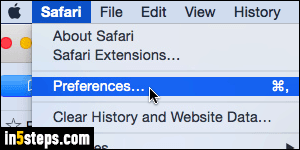 Out-of-the-box, Safari uses Google as "default search engine": that's the search engine automatically used when you launch web searches from Safari's address bar (what Apple calls the "Smart Search Field"). 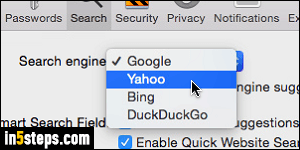 Safari supports four search engines: Google Search, Yahoo, Bing, and DuckDuckGo. 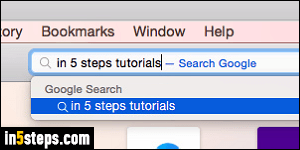 A later tutorial will show you how to add custom search engines to Safari (creating search engines from websites' search forms, like Amazon for example). 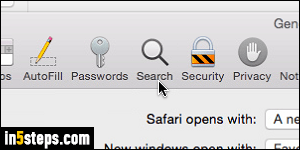 Click on the Safari menu in the top left corner of the screen, and select Preferences; you can quickly access them with the Cmd+, keyboard shortcut. Select the "Search" options at the top. Under the Search Engine dropdown, select one of the built-in search engines you'd like to use instead. 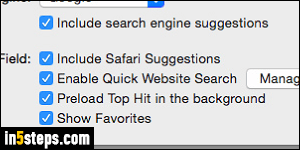 The "Including search engine suggestions" checkbox is checked by default: with that option enabled, Safari will suggest queries based on what you've typed so far. Auto-completion is supported by these four search engines, but might not for other, custom search engines you add later on. You can close the Preferences dialog once you are done. - "Include Safari Suggestions" will also search your browsing history. - "Show Favorites" will show websites you bookmarked as suggestions. - "Preload Top Hit in the background" starts downloading the web page Safari thinks might be your target, which makes it load quite a bit faster! - FYI: Bing powers Yahoo Search, so you'll get the same results with either.